South Gallia junior Kiley Stapleton (4) drives past St. Joseph junior Faith Mahlmeister (14), during the Division IV sectional semifinal on Wednesday in Rocksprings, Ohio. South Gallia junior Amaya Howell (right) shoots a layup over St. Joseph sophomore Emilee Blankenship (left), during the Lady Rebels’ 35-33 overtime setback on Wednesday in Rocksprings, Ohio. ROCKSPRINGS, Ohio — The Lady Rebels simply found themselves on the wrong end of a fantastic finish. As the final seconds of overtime ran off the clock in Wednesday’s Division IV sectional semifinal inside Meigs High School’s Larry R. Morrison Gymnasium, Ironton St. Joseph’s Bella Whaley passed to teammate Faith Mahlmeister for a wide-open layup, giving the eighth-seeded Lady Flyers a 35-33 victory over ninth-seeded South Gallia. The Lady Rebels (6-14) missed their first dozen field goal attempts in the game and trailed 10-0 before an Alyssa Cremeens three-pointer broke the cold spell and ended the first period. 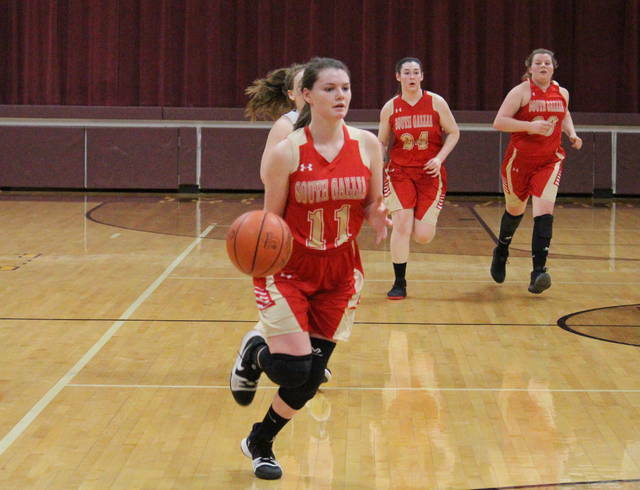 South Gallia evened the game at 10 with a 7-0 run over the first four minutes of the second quarter, but the Lady Flyers (12-11) rattled off five straight points and led 15-10 with 1:30 left in the half. The Lady Rebels went on a 4-to-2 spurt to close the canto, and headed into the break down 17-14. The Purple and Gold gained some breathing room with a two-pointer to open the second half, but SGHS scored the next six points and took its first lead of the night on a Christine Griffith two-pointer off an assist from Jessie Rutt with 2:40 left in the third. St. Joe regained the lead at 22-21, but back-to-back Faith Poling two-pointers gave SGHS a three-point lead with 1:41 to go in the third. 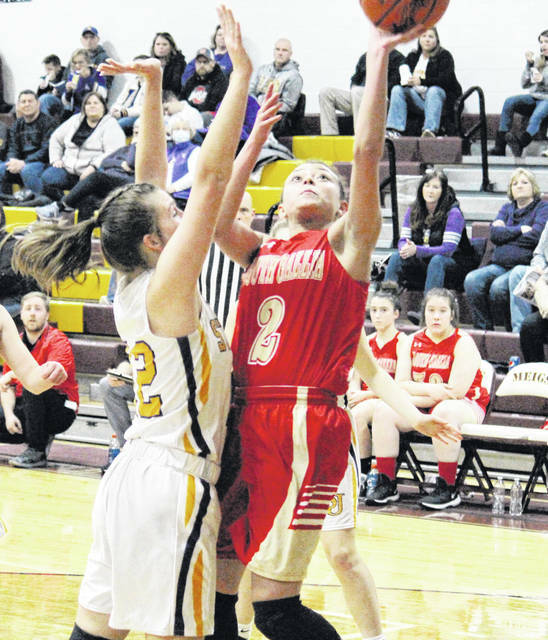 The Lady Flyers scored the final bucket of the third, but South Gallia got the two points back within the opening two minutes of the finale. After a two-pointer by each team, Emma Whaley made a traditional three-pointer to tie the game at 29 with 2:26 remaining in regulation. 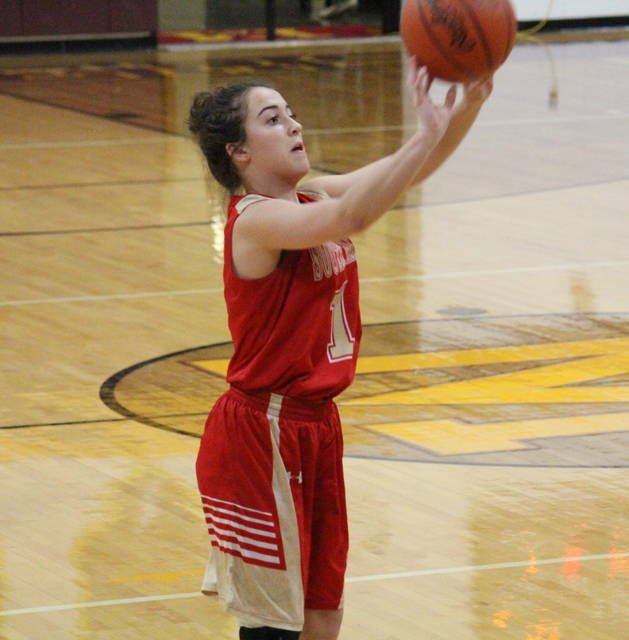 SGHS reestablished its lead with a free throw by Poling, but Emma Whaley sank a free throw of her own to tie the game at 30 and force overtime. After nearly three minutes of scoreless basketball to start the extra session, Emma Whaley gave the Lady Flyers a 33-30 lead with a trifecta at the 1:11 mark. However, just 10 seconds later, Rutt made an old-fashioned triple to tie the game at 33. The Lady Flyers inbounded the ball from the baseline with 10 seconds left in overtime, Bella Whaley made a skip-pass from the left wing to the right block, finding Faith Mahlmeister for the uncontested game-winning layup as time expired. Following the 35-33 setback, SGHS head coach Corey Small talked about his team’s hard work and the pressure of playing postseason basketball. South Gallia connected on 11-of-62 (17.7 percent) field goal attempts, including 3-of-13 (23.1 percent) three-point tries, while St. Joseph shot 15-of-52 (28.8 percent) from the field, including 2-of-11 (18.2 percent) from three-point range. At the foul line, the Red and Gold were 8-of-13 (61.5 percent) and the Purple and Gold were 2-of-4 (50 percent). St. Joseph outrebounded the Lady Rebels by a 44-to-37 clip, with SGHS earning a 16-to-14 edge in offensive boards and winning the turnover battle by a 21-to-11 count. 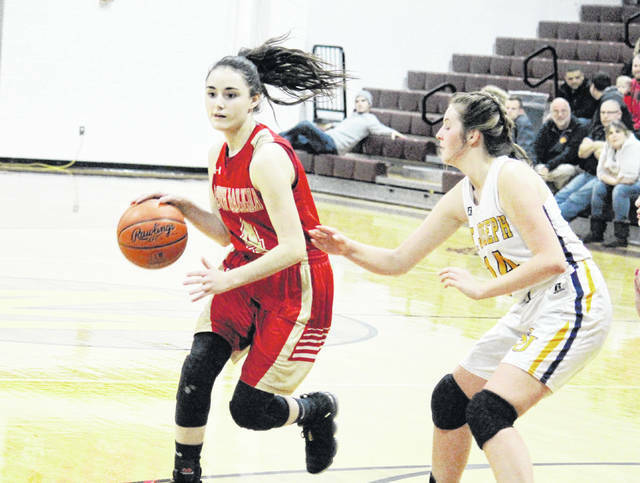 As a team, South Gallia recorded 15 steals, six assists and one block, while the Lady Flyers had eight assists, six steals and four rejections. Rutt led the Lady Rebels with team-highs of seven points, 11 rebounds, five assists and five steals. Griffith, Poling and Kiley Stapleton scored six points apiece for SGHS, with Griffith grabbing nine rebounds and Poling rejecting a shot. Rounded out the South Gallia offense, Amaya Howell scored five points and Cremeens added three. Emma Whaley led the victors with 14 points, followed by Mahlmeister with a double-double of 10 points and 10 rebounds. Kaitlyn Sheridan scored seven points in the win, while Emile Blankenship and Bella Whaley ended with two points apiece. Bella Whaley earned 11 rebounds and five assists in the win, while Sheridan and Mahlmeister led the St. Joseph defense with four steals and three rejections respectively. Without a senior on the squad, Coach Small hopes that this heart-breaking loss will stick with the Lady Rebels and propel them to a great offseason. St. Joe will be back at MHS on Saturday to face second-seeded Eastern in the sectional final.